The City of Aspen Water Department and the Pitkin County Landfill are partnering to provide and distribute gardens specially designed for our altitude and climate. The so-called ‘gardens in a box’ will include 28 plants, a plant care guide and an easy to follow “plant by numbers” design created by a professional landscape gardener. The Center for ReSource Conservation (CRC) designed the gardens for a high alpine desert environment using native and drought resistant plants. These low maintenance gardens are designed to be both beautiful and to save water. Gardens are available now for purchase online (www.conservationcenter.org) and can be picked up at the 2nd Annual Field Day at Cozy Point Ranch on June 13th. They will be fully hardened and ready to plant. “Although anyone in the area can buy these gardens, Aspen residents will receive a $25 discount per garden. This discount is offered to encourage water conservation,” said Karen McConnell, administrative assistant at the department. These gardens in a box are also designed to promote the “Xeric” landscaping model. 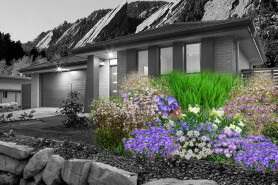 “Xeric gardens, which means low water and low maintenance, are the perfect landscape design for areas concerned with water conservation,” McConnell added. The gardens also offer neonicotinoid-free plants. An increasing number of studies have shown that neonicotinoids have harmful effects on bee populations, and CRC has intentionally chosen to offer plants that have not been treated with these chemicals. “The layout made it easy to plan my space...The plants were very healthy and it was easy to pick up my all plants at once,” said Darren Dybala, an Aspen resident who planted such a garden last year. “It’s even better to know they won't harm the bees,” he added.